Are Brands Finally Waking Up to the Potential of Sponsored Content? Around this time last year, and mostly on a lark, I left a post here asking for sponsors for a Live #Blogchat at SXSW. Honestly, I didn’t expect to get any responses, but within 15 minutes of publishing my post I started receiving offers, and within an hour, my friends at 1680PR were on as the Main Sponsor of the first-ever Live #Blogchat. That would be the first of 7 Live #Blogchats held in 2011, and I’m planning on announcing the first Live #Blogchat for 2012 in just a few days. What was really interesting was what happened next. As soon as I arrived in Austin for SXSW, everyone had 2 questions for me. The first was ‘So how does a Live #Blogchat work?’, and the second was ‘So who is 1680PR?’ Answering the first question paved the way for my getting more Live #Blogchats throughout the year. In fact, I met Joe Pulizzi at the Houston airport flying INTO Austin for SXSW, told him about the Live #Blogchat, and that began the conversation that would eventually lead to me doing a Live #Blogchat at the Rock N Roll Hall of Fame to kick off Content Marketing World. I got to spend a lot of time with Ken during SXSW, and he got to meet a lot of the people I know in this space, and they got to know him. To this day, during #Blogchat on Twitter I will see Ken jump in and immediately some of the people he met during SXSW will chime in and say hi! I had so many of my friends pull me aside during SXSW and tell me how much they liked Ken, and was glad 1680PR had helped sponsor the Live #Blogchat. 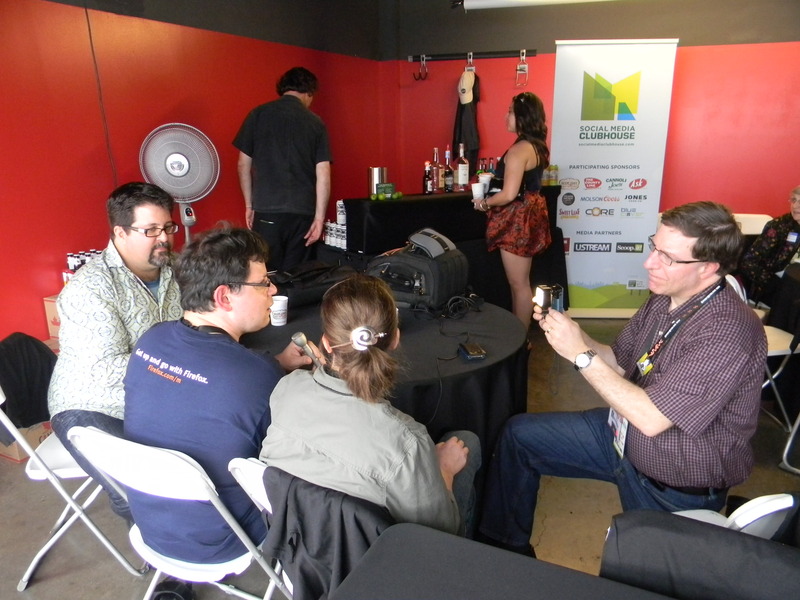 Also during SXSW, I got to talk to my friend Tom Martin about how he was providing sponsored content at TalkingWithTom.com. What Tom did was go around the country interviewing some of the top thought leaders in the social media marketing space, and once a week he would post a new video interview he had done with them. And Emma sponsored the site. It was a smart move by Emma, because they got to have their brand associated with all these smart people, but they also made possible the creation of this site, which created value for others. Tom and I have spent the last year discussing the idea of sponsored content. But not just that, but the idea of how companies could benefit more from partnering with content creators that have an established community versus simply connecting with influencers. For example, if a brand contacts an influencer about promoting their product, the influencer may be willing to promote the product if they are properly compensated, maybe with money, or maybe with a free product. But if a brand contacts me about sponsoring #Blogchat, my first question is ‘Will this sponsorship create value for the #Blogchat community?’ This is an important distinction, because whereas the influencer’s motivation might be in receiving the free product, my motivation is in getting money from the #Blogchat sponsorship, but also in seeing how that sponsorship can be leveraged to create more value for the #Blogchat community. 2 – The income generated from the sponsorship will allow me to devote more time to building the #Blogchat brand and providing more value to its community. Which will grow the #Blogchat community, ultimately providing even more value to the sponsor. I really think you will begin to see more brands moving toward working with content creators to sponsor their content. In fact, I’ve been talking to several other Twitter Chat hosts over the last several weeks, and many of them had either recently brought on sponsors to their Twitter chats, or were being approached by major brands about sponsorship opportunities. Both company and bloggers say they aren’t concerned that readers may be turned off by commercial relationships between the travel agent and writers. Kim Mance, a Brooklyn, N.Y., video blogger and co-founder of Galavanting, a site aimed at female adventure travelers, says disclosure is important for readers but bloggers need to retain the mission and voice that garnered an audience in the first place. “Bloggers will miserably fail and lose their audience if they piss them off,” Mance says. This speaks to why I think sponsored content makes so much sense. Bloggers, for example, that have built up a following, are smart enough to know that if they bring on a sponsor, and their content suffers as a result, that they will lose that following. So naturally, they only want to bring on sponsors that will bring VALUE to their following, because they want to GROW that following. Which means they can get MORE sponsors. It really does seem like a win-win when properly executed. BTW if your company would like to talk to me about sponsoring #Blogchat on Twitter for either 3 or 6 months, please email me. Since it is a 3-6 month sponsorship, it will be a bit more, but the benefits will be greater as well versus simply sponsoring one week. Content needs to be relevant so sponsorships associated with content need to be relevant. I love your point of view here and how brands are starting to really pay attention to where they are going to resonate the highest and what will make the most sense. Who is likely to participate in a live #blogchat? If that is not your audience, then you probably shouldnt be the sponsor for the event no matter how wide your purse opens. Content Creator – How can I leverage this money to create BETTER content and a better experience for my audience? That will make it easier to get MORE sponsors moving forward. Sponsor – How can I leverage this sponsor to connect with this audience and how can I leverage that connection to create an ONGOING RELATIONSHIP with these people? When both parties approach the sponsorship in this manner, the clear winner is THE AUDIENCE. Typically, the audience is an afterthought when it comes to sponsorships, which is why they rarely work. The content creator just wants the biggest check possible, while the sponsor just wants to ‘get in front’ of the audience with the most impressions. Hopefully, we can start the conversation about how to change that mentality for the better. Thanks for including the Talking With Tom project in this discussion — like you, I too am looking at the coming year and where to take that particular platform and of course, for sponsors. Two important distinctions that I’d add to this discussion — and stuff you and I have talked about — is the difference between these two types of content. I’d argue that your #BlogChat is actually less of a content sponsorship and more of a community sponsorship. You’ve done such an awesome job building up the #BlogChat brand and the community and now brands like Dell and 1680PR are willing to pay YOU for SANCTIONED ACCESS to that COMMUNITY. I’d argue that’s different than what I did with Talking With Tom and Emma and previously with MyMardiGrasExperience.com and Tabasco. In both cases, there really wasn’t a community per se (outside my own followers) but there was a specific type of content — in TWT it was Thought Leadership and with MMGE it was Mardi Gras and a chance to be a part of it virtually. In both cases, the brands were underwriting the content and based on the Intent to Purchase Research we did around MMGE, it works. In that effort we saw a significant rise in post Mardi Gras reported Intent to Purchase of Tabasco as well as Sheraton (the 2nd sponsor). We also saw positive brand linkage movements for Tabasco on key brand drivers. So I think brands needs to look at these types of longer form, longer-term content/community sponsorship opps as real marketing opps. At lease one study (the one we did with MMGE) statistically shows that there IS a positive correlation to moving key brand/purchase drivers and that is what marketers today are demanding. Good stuff…. looking forward to more convo’s with you on this… exciting stuff. I think Lee’s comments are what a lot of people think of most sponsorships, that the brand is just there to try to ‘look cool’, and doesn’t really care about participating in the community.